Notice also some of the other weapons – the Word of God, fasting, prayer, and almsgiving – the cardinal disciplines of Great Lent. Just a note: all of these are essential to a healthy participation in the Holy Eucharist. I have, after the reflection, also included a pre-communion and post-communion prayer that reiterate the spiritual warfare dimension of the Divine Liturgy. Basic Weapons: Mark 9:17-31, especially vss. 28-29: “His disciples asked Him privately, ‘Why could we not cast it out?’ So He said to them, ‘This kind can come out by nothing but prayer and fasting.’” This passage does not simply provide another account of a healing by the Lord Jesus; it constitutes an “action report” from the battlefield of spiritual warfare. A father and his son are overwhelmed by the enemy (vss. 17=18). The disciples skirmish with the unclean spirit, but cannot dislodge it (vs. 18). Finally, the Lord enters and defeats the foe (vss. 19-27). After the victory, the Commander instructs His trainees as to why certain weapons are crucial in spiritual combat (vss. 28-29). In the concluding verse, the Lord Jesus announces the approach of His great and final battle and His subsequent victory (vs. 31). This Gospel is directed to all of us who are engaged in constant spiritual skirmishes and battles. It is helpful to begin our approach to these verses with a passage from Ephesians in which the Apostle Paul discusses the basic rules of engagement with the enemy. First and foremost, our strength comes from the Lord (Eph 6:10). We must use the armor He provides (vss. 11, 13) when we are confronted by the wiles and power of our foe (vss. 14-16). In addition, the apostle describes the weapons required to win the spiritual struggle: Holy Scripture, prayer, the holy mysteries, and watchfulness (vss. 10, 17-18). Although Saint Paul does not mention fasting, the Lord reminds us of that weapon in today’s passage. Addressing the relationship between fasting and prayer, Blessed Theophylact says: “Both are necessary. Good sense dictates that . . . one . . . must not only fast, but also pray; and he must not only pray, but also fast, for true prayer is rendered when it is yoked to fasting” (Explanation of the Gospel According to Saint Mark, p. 77). Saint John Chrysostom explains the connection: “He that fasts is light, and winged, and prays with wakefulness, and quenches his wicked lusts, and propitiates God, and humbles his soul when lifted up” (“Homily 57 on Matthew,” NPNF First Series, vol. 10, p. 356). Let us thoughtfully review each of the five essential weapons of spiritual warfare. Holy Scripture – the life-giving words of God – is a must for discerning truth and the will of the Lord in the midst of the myriad attacks we endure. As the core of Orthodox tradition, Scripture provides us with the light to cut through the smokescreen of lies from the enemy. Prayer is our second essential weapon, and draws directly from Holy Scripture. In fact, we should become adept at using the language of Scripture to form our words of prayer. The Divine Liturgy, which is soaked in Scripture, demonstrates the method we follow. The holy mysteries are the third weapon for disciples in combat. 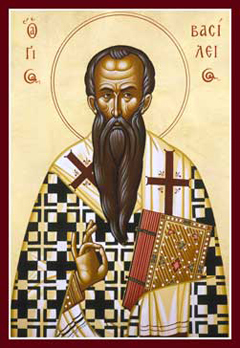 According to the pre-communion prayer of Saint Basil the Great, they move us to “boldness . . . increase of virtue . . . [and] keeping of [God’s] commandments.” The sacrament of communion shapes and molds our lives, making us resilient in Christ. Fasting, in the manner prescribed by the Church, sharpens our spiritual awareness of what is happening around and within us. Let us carefully observe the days, seasons, and times of fasting, always following the directions of regular Orthodox practice as our guide. Finally, watchfulness is the hallmark of Christ’s warrior at all times and in all circumstances. We are especially blessed to have the Jesus Prayer to aid us in the struggle against “the evil imagination, wicked deeds, and work of the devil” that seek to oppose us. O Lord of mercies, enlighten the eyes of our understanding by Thy Holy Scriptures, enable us by Thy Spirit to pray as we ought to pray, strengthen our wretched souls and bodies through Thy Holy Gifts, help us to subject our flesh by abstinence and blameless fasting, and awaken us to cultivate watchfulness zealously that we may be victors unto the end. I know, O Lord, that I have communion unworthily of Thy most pure Body and Thy most precious Blood, that I am guilty and drink condemnation to.myself not discerning Thy Body and Blood, O my Christ and God. But daring upon Thy generous loving-kindness I come to Thee who hast said: “He who eats my flesh and drinks my blood abides in me and I in him.” Be merciful, therefore, O Lord, and do not rebuke me a sinner, but deal with me according to Thy mercy, and let Thy holy things be for my purification and healing, for enlightenment and protection, for the repulsion of every tempting thought and action of the devil which works spiritually in my fleshly members. Let them be for boldness and love for Thee, for the correction and grounding of my life, for the increase of virtue and perfection, for the fulfillment of Thy commandments, for the communion of the Holy Spirit, for the journey of eternal life, for a good and acceptable answer at Thy dread judgment, but not for judgment or condemnation. Amen. Freely Thou hast given me Thy Body for my food, O Thou who art a fire consuming the unworthy. Consume me not, O my Creator, but instead enter into my members, my veins, my heart. Consume the thorns of my transgressions. Cleanse my soul and sanctify my reasonings. Make firm my knees and body. Illumine my five senses. Nail me to the fear of Thee. Always protect, guard, and keep me from soul destroying words and deeds. Cleanse me, purify me, and adorn me. Give me understanding and illumination. Show me to be a temple of Thy One Spirit, and not the home of many sins. May every evil thing, every carnal passion, flee from me as from a fire as I become Thy tabernacle through communion. I offer Thee as intercessors all the saints: the leaders of the bodiless hosts, Thy Forerunner, the wise apostles, and Thy pure and blameless Mother. Accept their prayers in Thy love, O my Christ, and make me, Thy servant, a child of light. For Thou art the only Sanctification and Light of our souls, O Good One, and to Thee, our Master and God, we ascribe glory day by day. Amen. As we continue our transformative pilgrimage through the province of Christmas toward the province of Theophany, let us hearken to the universal characteristics of the land in which we journey – the Kingdom of God (the land of our salvation). I have underlined the themes I noted as I reflected on it during my quiet time this morning. Perhaps you will be blessed by what I have noted. God on earth, God among us! No longer the God who gives his law amid flashes of lightning, to the sound of the trumpet on the smoking mountain, within the darkness of a terrifying storm, but the God who speaks gently and with kindness in a human body to his kindred. God in the flesh! It is no longer the God who acts only at particular instants, as in the prophets, but one who completely assumes our human nature and through his flesh, which is that of our race, lifts all humanity up to him. How, then, you will say, did the light come everywhere, through one sole person? In what manner is the Godhead in the flesh? Like fire in iron: not by moving about, but by spreading itself. The fire, indeed, does not thrust itself toward the iron, but, remaining where it is, it distributes its own strength to it. In doing so, the fire is in no way diminished, but it completely fills the iron to which it spreads. In the same manner, God the Word who ‘dwelt among us’ did not go outside himself; the Word which was ‘made flesh’ underwent no change; heaven was not deprived of him who controlled it and the earth received within itself him who is in heaven. Look deeply into this mystery. God comes in the flesh in order to destroy the death concealed in flesh. In the same way as remedies and medicines triumph over the factors of corruption when they are assimilated into the body, and in the same way as the darkness which reigns in a house is dispelled by the entry of light, so death, which held human nature in its power, was annihilated by the coming of the Godhead. In the same way as ice, when in water, prevails over the liquid element as long as it is night, and darkness covers everything, but is dissolved when the sun comes up through the warmth of its rays: so death reigned till the coming of Christ; but when the saving grace of God appeared and the sun of justice rose, death was swallowed up in this victory, being unable to endure the dwelling of the true life among us. O the depth of the goodness of God and of his love for all of us!